2015 has been the year of the tanker. The fundamental improvements with slow supply-side growth for some years coupled with low oil prices from mid-2014 created strength on both sides. Freight rates started to take off in October 2014 for all types and sizes. The combination of an early start to the fourth-quarter seasonal strength heading into winter and the fact that the oil prices continued to slide became a catalyst. Throughout 2015, the global refinery throughput has been on a rise. The normal seasonal lower throughput in the first half of the year with widespread maintenance did not occur. Owing to rising and already elevated refinery margins from East to West, refineries simply wanted all the crude oil they could get. 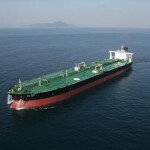 This development still provides strong demand and solid freight rates for the tanker industry. In India, we saw a record of 4.74 million barrels per day (mb/d) of crude throughput in June, marking a truly global trend, whereas Middle Eastern refineries also hit a record throughput because of increased runs in Saudi Arabia. October is traditionally another month of lower throughput as refineries get ready for the winter season when crude runs normally peak. Moreover, the American â€œLabor Dayâ€ on 7 September marks the end of the US driving season which started on Memorial Day, 25 May. This means that the recent 10mb/d production of gasoline will come down. Some of that weakness may already have caused freight rates to come down sharply, in combination with the global financial uncertainties originating from China. 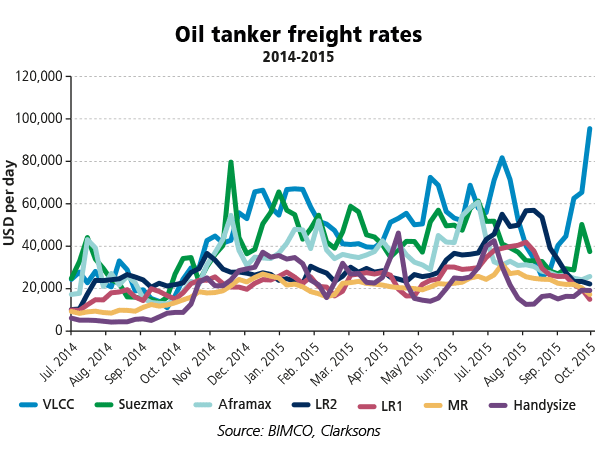 Very large crude Carriers (VLCCs), Suezmax and Aframax have seen freight rates cut in two since mid-June, while Handysize has been the one to drop the most among oil product tankers. In a rush of excitement, itâ€™s easily forgotten that such high refinery crude runs can only go on for so long, if end consumption supports it. End consumption has supported it some of the way but not all the way. Swollen stocks of crude oil and oil products are now seen everywhere. Preliminary OECD total industry stock change in second-quarter was 1.1mb/d. All stocks but gasoline increased, US crude oil stocks too. In comparison global oil demand dropped by 0.1mb/d over the same period of time and is expected to see an increase of 1.6mb/d to be consumed for the full year over 2014. 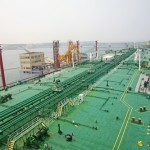 Contrary to what happens too often, the strong freight markets for oil product tankers have not resulted in a knee-jerk run to the shipyard to order a massive amount of new ships. 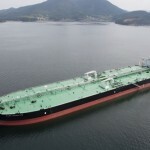 This stands in opposition to the crude oil tanker orders seen in 2015, as if the lid has come off finally after several years of resisting the temptation. By end-August 2015, 56 product tankers with a total capacity of 4.8 million DWT, predominantly LR2 (20) and LR1 (21), have been ordered and will be delivered in 2016-17. They are aiming to get a share of the market for longer-haul trades out of Middle East refineries, predominantly into the Western markets. This ordering trend has been on for two years now. Among the crude oil tanker segments, we have already seen more orders for both Aframax and VLCCs than we did in the whole of 2014. Aframax in particular has been popular with investors this year; after six years with one order a month on average, 2015 has seen 29 new contracts in the first eight months. 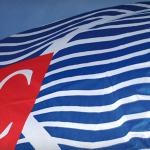 For the VLCCs, the orders with delivery in particular 2017 (21) and in 2018 (14) have been favoured by investors. 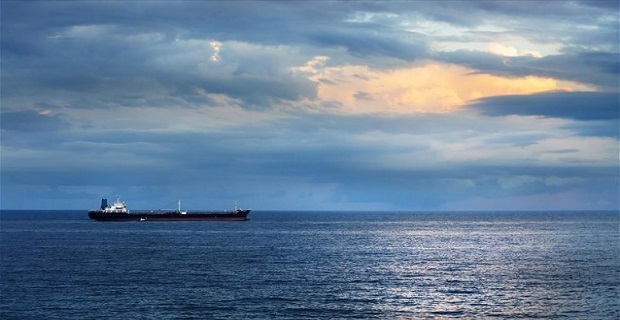 In 2015, 50 new VLCC contracts in total have been signed. One of the launchers which has lifted the freight rates into orbit is two years of very slow fleet growth. Today the fleet holds 648 VLCCs, whereas 628 VLCCs were active by mid-2013. Thatâ€™s a growth of just 3% in 26 months. Looking forward into the future inflow of crude oil tankers, we can see the delivery pace is picking up and the demolition potential is vanishing with just 14 VLCCs being more than 20 years old and another 16 getting inside the window of the fourth special survey in 2016. On order for a scheduled delivery during the next 16 months are 71 VLCCs. This means a double-paced inflow as it has taken 34 months for the latest 71 VLCCs to be put into active service. The change in supply-side conditions will slowly tighten the freight market, and as we look into 2016, the tide could turn fundamentally as a fleet growth of 4.4% is likely to outstrip demand growth. As the coming two years are now â€œfullâ€ in terms of remaining in control of supply-side growth, any additional crude oil tanker orders should be placed for 2018 delivery. 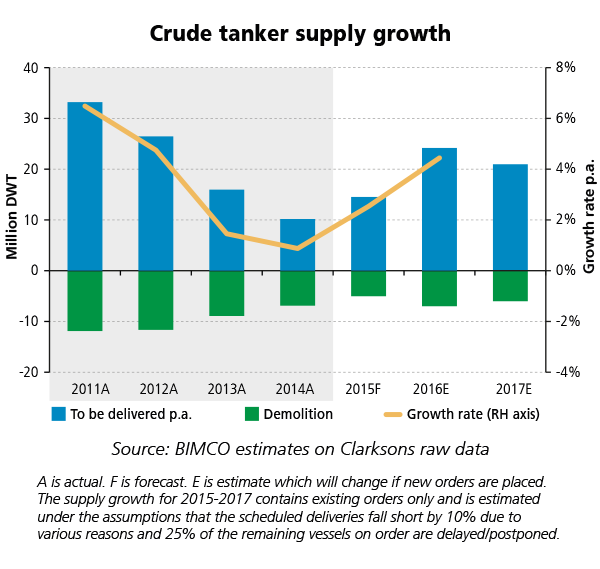 BIMCO forecasts the present and next year supply growth for oil product tankers to be at 5.4% and 5.7% respectively, meaning two â€œfullâ€ years too for that segment. Looking forward, the winter markets are expected to soften, as the eventual lower refinery crude oil throughput when no more stocks can be filled and margins begin to crumble as demand slips. 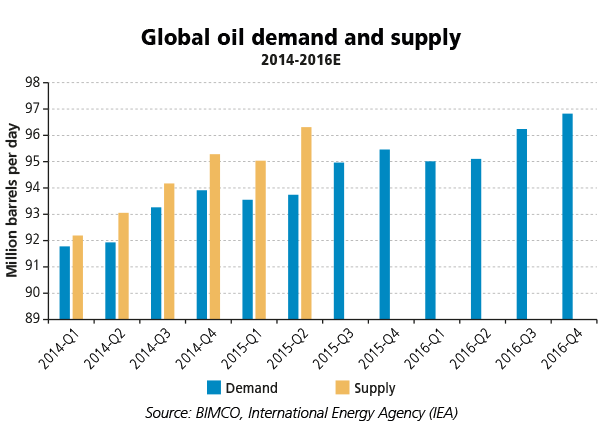 Until then BIMCO expects earnings for both crude oil and oil product tankers to remain strong. Our expectations are primarily supported by low fleet growth for crude oil tankers and long-haul trades for oil product tankers. High volatility in freight rates can be expected in the coming half year half a year, when it may also be prudent to look at the time charter market, where one- and three-year time charter rates are both at their highest level since 2009. At USD 48,000 per day and USD 43,500 per day, time charters will make positive returns after all costs inclusive of capital cost and depreciations are deducted. In the longer run, an eventual repeal of the US crude oil export ban will likely have some impact on the tanker trading lanes. The US congress is set to vote on the issues during this autumn. For the supporters the case is clear: US refineries are saturated with light sweet crude which is produced abundantly. For those in favour of keeping the crude oil export ban still in place there is â€œnational interestâ€, which currently seems to hold the upper hand. Currently, the only crude oil exports today go to Canada (0.5mb/d). Moreover, the eventual lifting of international sanctions on Iran is likely to see a steady increase in crude oil, both sweet and sour, into the market over the coming one to three years, depending on much-needed investments to boost production and time to regain market shares. BIMCO expects the re-entry of Iranian crude oil into the market will change trade patterns as other suppliers will be squeezed on their market share. 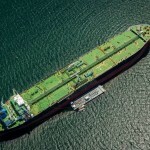 The key will be West African produced sweet crude now going to Europe and East Asia. The latter is the vital one and a stronghold behind the current upturn. 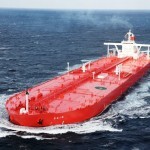 The overall impact on the tanker earnings from these changes holds the potential to become both negative and positive.